Home > News and Videos > News > Why buy the 2017 Audi A4? If you are in the market for a luxury sedan, it would be an understatement to say that you have plenty of options available to you. The reality is that luxury automakers are continually pushing the envelope to bring even more competitive vehicles to the market because they know that consumers have a lot of choice. Take the 2017 Audi A4, for example. Completely redesigned last year, the 2017 Audi A4 faces some stiff competition from other models that have also established their reputation, that are priced very similarly, and that offer basically the same level of performance. Ultimately, it’s hard for a model like the A4 that is competing in the compact luxury sedan segment to truly stand out from a tangible, numbers-based standpoint. Granted, the same could be said for any of the A4’s competitors. The models in this category are just too closely spaced to carve out a clear winner using specs. That’s good news for consumers, but the fact remains that to choose which model best suits you, you have to have a clear understanding of your needs. So, why buy a 2017 Audi A4? So, we are back to our initial question. As mentioned previously, we have to look at the intangibles. In doing so, what we tend to realize is that the 2017 Audi A4 stands out mainly because of just how balanced it is. It also scores points with most consumers from a design standpoint, but we won’t go there because style is very subjective. If you are reading this, we assume you like the A4’s design. Back to balance, that is truly where the 2017 Audi A4 shines. It offers a well-rounded approach to a luxury compact sedan. What that means is that BMW models tend to focus heavily on performance while Mercedes-Benz models are very comfort-oriented. When it comes to the 2017 Audi A4, you get a model that is really in between in regards to performance and comfort. Out on the road, the 2017 Audi A4 provides exemplary comfort that hides bumps and potholes, and leaves its occupants in a cocoon of silence which instills confidence and makes the driver feel better, simply put. On the other hand, should you come across a winding road that you want to enjoy, the 2017 Audi A4 will be right there with you. It’s turbocharged engine provides ample torque, but it is also very fuel-efficient. 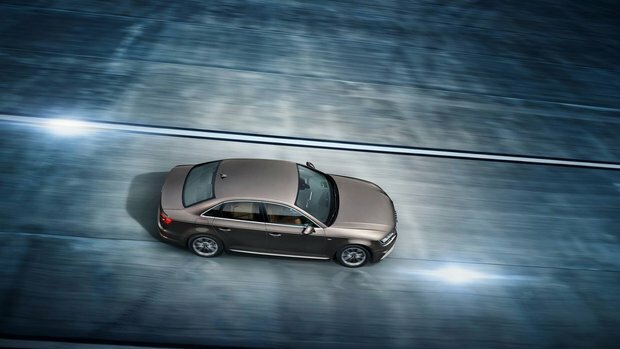 With Audi’s Drive Mode Select system, you can adjust how the car behaves. And of course, Audi’s Quattro all-wheel drive system, one of the most advanced and capable systems of its kind in the industry, is always watching over you while also making winter driving an enjoyable affair. So, why buy a 2017 Audi A4? Because it is the most balanced compact luxury sedan on the market, and it will never ask you to compromise comfort for sport, or vice-versa. To learn more, contact us today at Glenmore Audi!